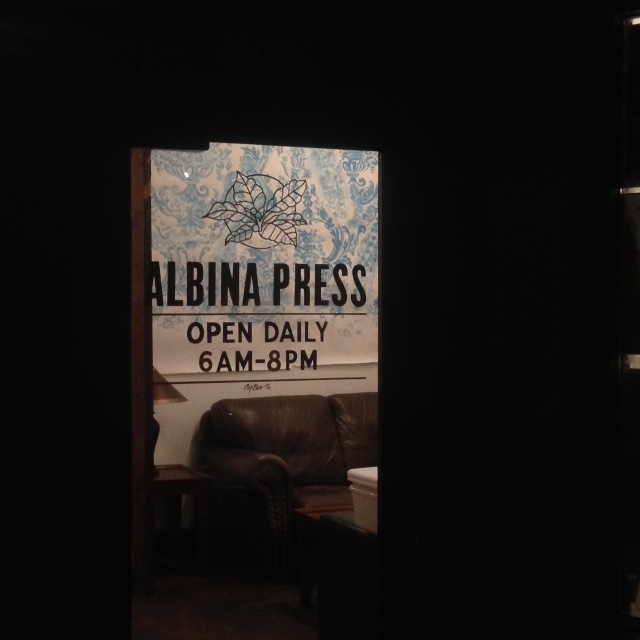 to view a NEW body of work NOW showing @ The Albina Press on Hawthorne. This work is divine in this space. 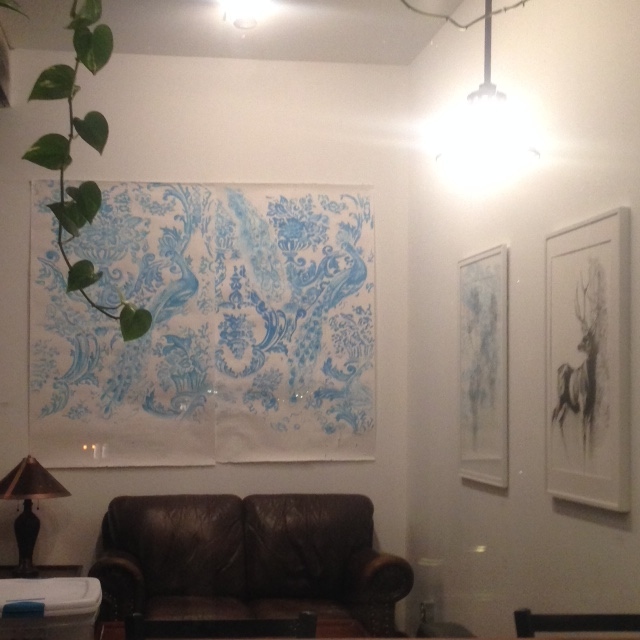 With this hanging I got to realize the dream of having these pieces hung like wall paper! the affect is more than striking. 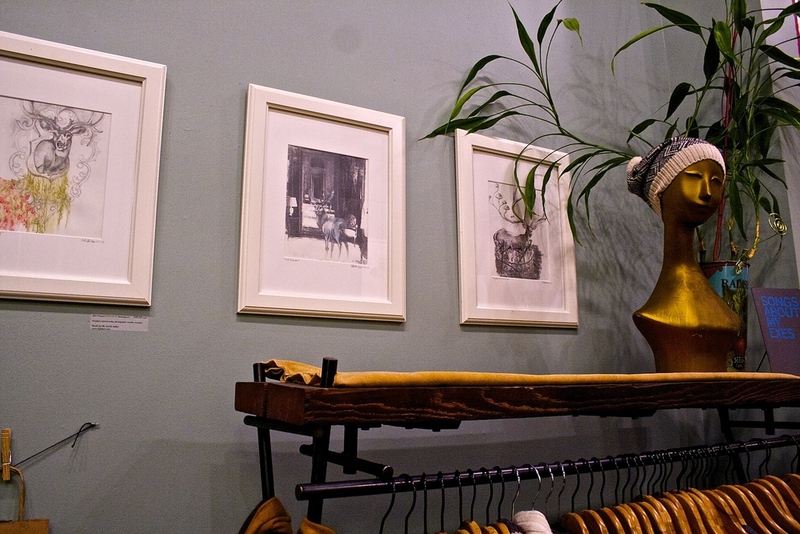 A big thank you goes out to their awesome curator Ashley and to the owners for keeping it classy. 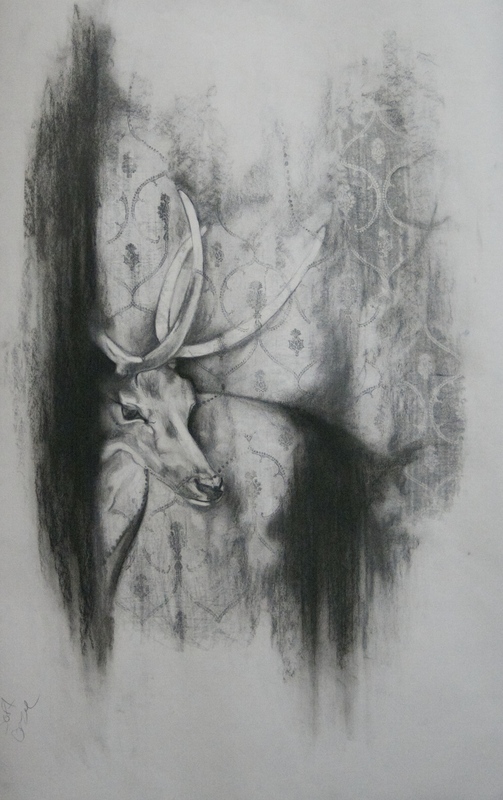 The deer are a great addition to their walls for a month. Go in and shop the show, pick up prints or cards, and something fashionable to ware (they have plenty of great threads and sparkly baubles). 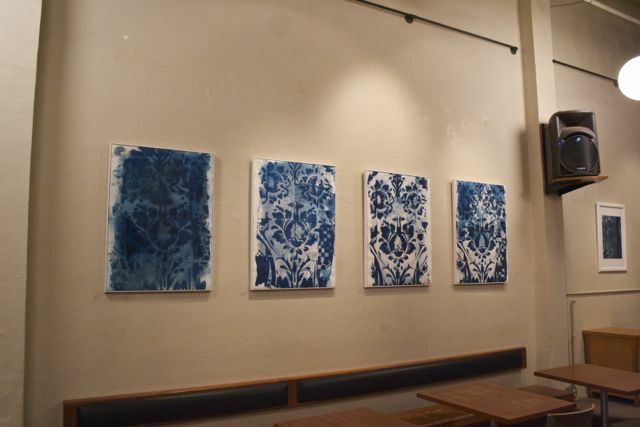 For The Blue Print Series, her first solo exhibition at Stumptown, Arielle Adkin made use of a singular, vintage, damask flower motif. 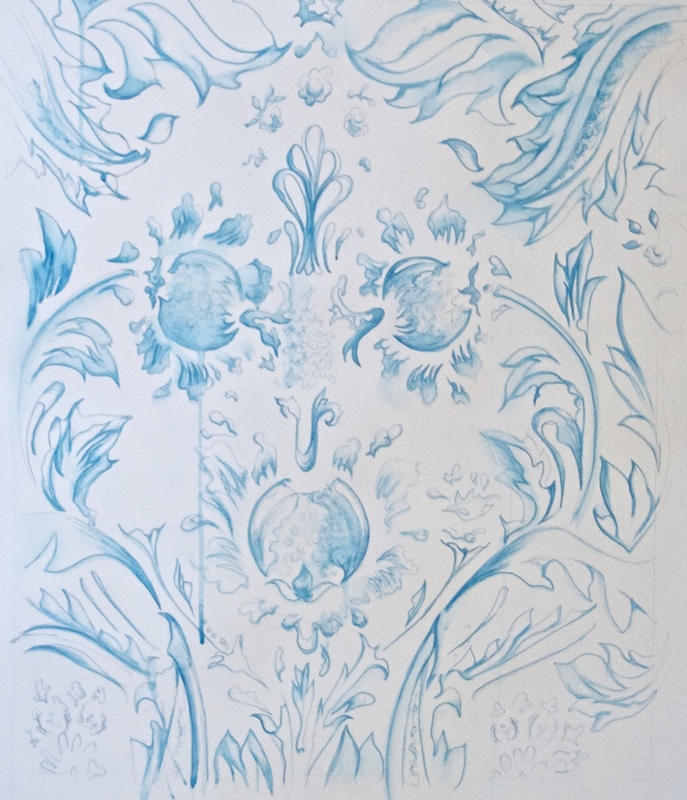 In an effort to simplify the subject to the essence of pure pattern design, she at times tweaked, re-scaled, painted, printed over, drew on, and Cyanotyped the motif. Reminiscent of textile or wallpaper, these pieces hung together expend from simple surface into the realm of a glorious interior where mark-making and the power of artistic gesture reign. As the last FIRST THURSDAY, for yours truly, approaches I wanted to look back on the season (images below). I have learned so much and have had great time interacting with you all on our Pearly streets. There is nothing so informative as the automatic responses and feedback given directly from your community. This Thursday will be no exception. This week you can expect quite a bit more of a selection small Bird original oil paintings, some great color deer prints on fine art paper and the show stopping large oil painting of Deer! As before I plan on being close to the corner of 13th and Irving (baring the weather or not making the wait list) with lost of whimsy, sun shine, an open attitude ready to SALE SALE SALE! Seriously, it's the end of the season, help the birds and deer fly and frolic to a good home! First: Peony Violence, flowers burst and parrots meld into paisley. Opens on Second Thursday May 8th @ Optik PDX on Mississippi ave from 6-8. Join me for toast. 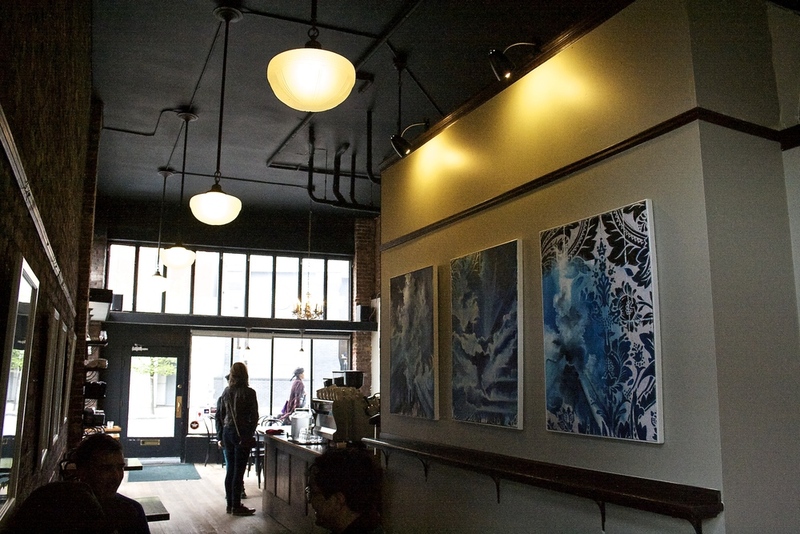 Second: The Recycled Rain Project Opening event on Saturday May 10th from 6-10 @ Olympic Mills Gallery. As an open call artist I am featuring a Cyanptype photo-collage made in the sun and washed with collected rain water. Third and N O W showing: Urban Green Series @ Floyd's Old Town Coffee Shop. This mixed media drawing mimic our urban landscape with a faeries wheel riding tall on the waterfront. 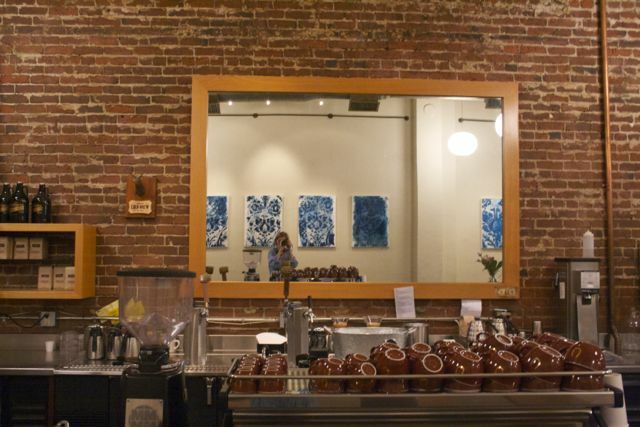 Stop in the backroom on your way to summer and view the dystopia of Portland. 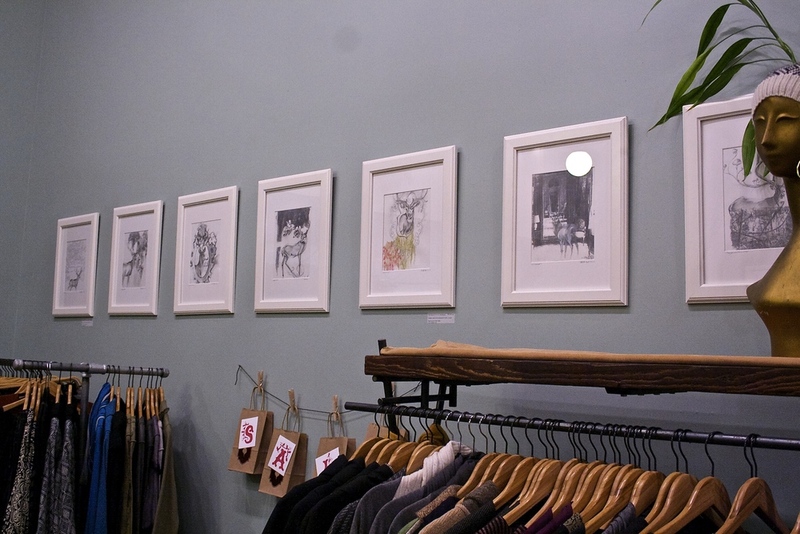 This show is hanging in honer of the romance of February. it is an expression of real love. I am happy to have four pieces in this show all featuring our Portland land marks being taken over by jungle like greenery, a future where all things are returning to nature. This is a mixed media series making use of one stunning vintage damask flower motif. 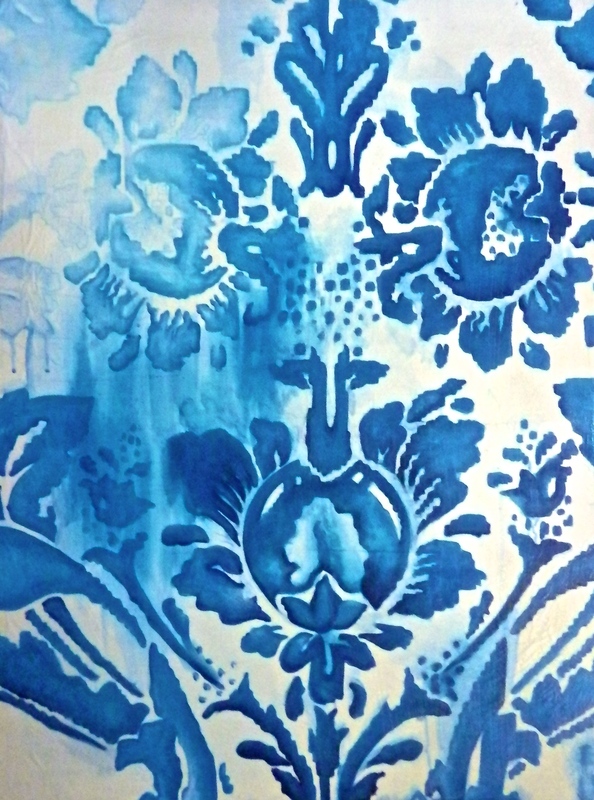 The damask pattern has been tweaked, re-scaled, painted, drawn on and printed over, covered with paper, and printed as a Cyanotype. All in an effort to simplify the subject to the essence of pure pattern design. 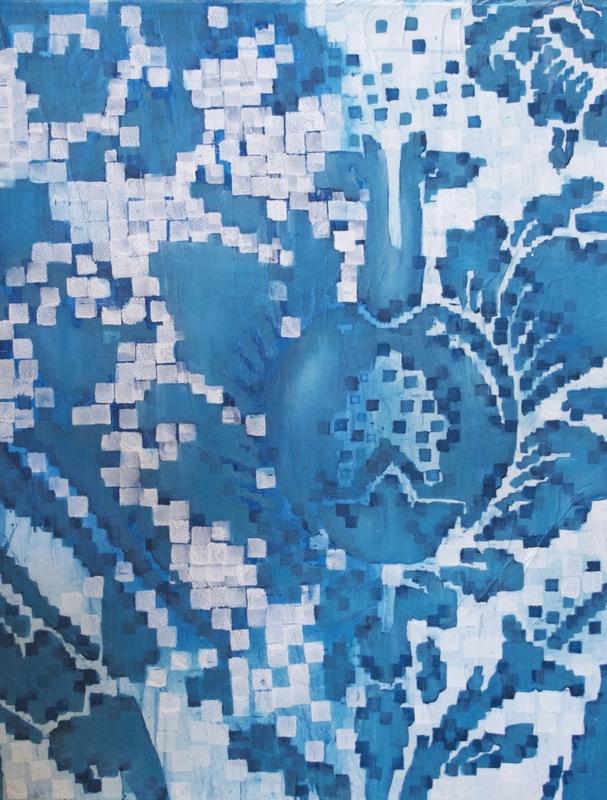 These pieces all become reminiscent of textiles or wallpaper which amplify the artistry with painterly techniques. They allow the viewer to compare hand-made to machine-made. When this collection is hung it creates an imaginative and cohesive space. 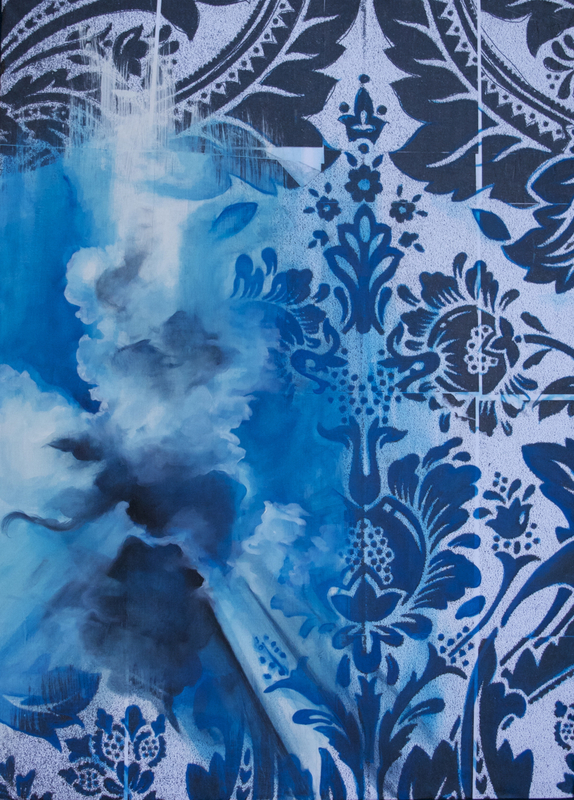 All together this series is a collection of “royal” wallpaper that goes beyond simple surface into a realm of a glorious interior, where mark making and the power of artistic gesture reign.